Welcome to the new Regale website. We will be posting recipes and news here on a regular basis so watch this space! Feel free to have a look around at our delicious product range or get in touch with us if you have any questions. Did you know that for much of the 19th century Cork was the most important butter-handling port in the world? So important was the butter-trade to Ireland that there is a Butter Museum in Cork, and the Butter Exchange and Market was busy from the 1770s to 1925? The butter produced in Ireland is usually what is termed “sweet cream”, and is made from fresh pasteurised cream. 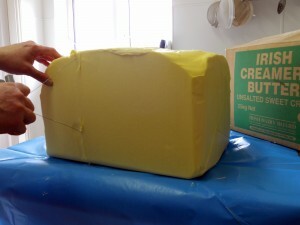 The butter made in the countries of mainland Europe is more often “lactic” or cultured butter, where the cream has been soured before churning. Either style works well in baking. Why is butter best for baking? Butter starts to melt at about 30°C, and the temperature of the human body is around 37°C – so butter literally “melts in the mouth”. Many of the vegetable fats used in mass-produced baking are designed to melt at higher temperatures to ease production, and thus leave a ‘waxy’ sensation in the mouth. Some have been designed to melt at body temperature, but they have no true taste of their own, and are often flavoured with milk solids, and need emulsifiers and colours added.